Kindi which is the most senior level of Bwami, sub-divided into three grades, kyogo kya kindi, musagi wa kindi and finally lutumbo iwa kindi. Bunyamwa is the equivalent kindi grade for women. A Lega man must pass through all (voluntary) initiation societies respectively to be considered a rounded man with full insight into ancestral teachings and traditions. The Bwami association is also believed to strengthen bonds within the community. Each initiation society has its own associated objects and sculptures (isengo, pl. masengo meaning 'heavy things') including the lukungu ornament (sometimes called a 'mask'; meaning 'skull') used by kindi initiates. Passed from generation to generation, the lukungu ornament is handed down from father to his nephew (the Lega is a matrilineal line of decent). As such it is believed to represent the bond and continuity between father and son. The lukungu ornament is considered to be the most significant insignia of all Bwami grades and is the final category of objects within the society. 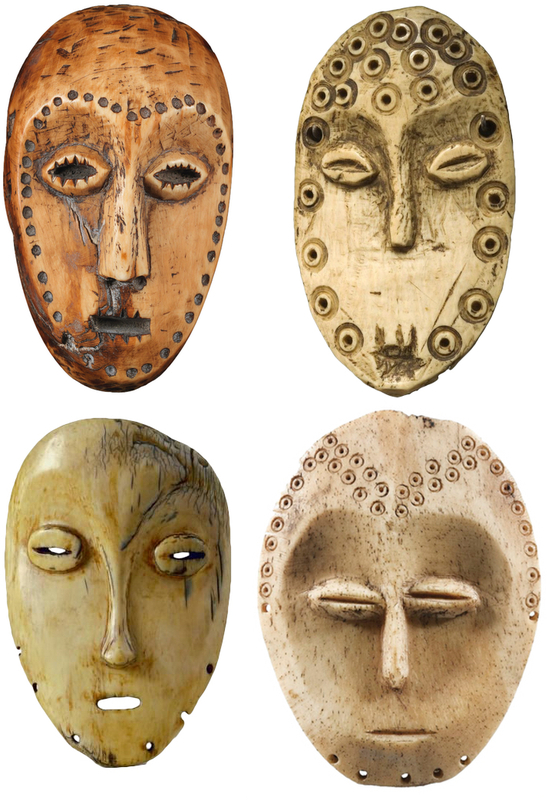 Unlike other Bwami ornaments, the lukungu ornament is never worn on the face or body. It is instead only held (or placed on a fence) during kindi initiations. At death it is placed on the previous owner's grave after which it is inherited by a nephew.